Philippa made the sea change to the Central Coast 3 years ago from a fast paced life, working in Sydney’s beauty industry. She knew she had found a sanctuary and community when she found Umina Beach Yoga. Philippa’s personal yoga journey began 10 years ago whilst she was working full time as a hairdresser, suffering with chronic lower back pain. This grew to a curiosity to discover the many aspects of yoga for whole mind/body health. Upon returning from Umina Beach Yoga’s Vietnam retreat in 2017, a desire to teach yoga was ignited. 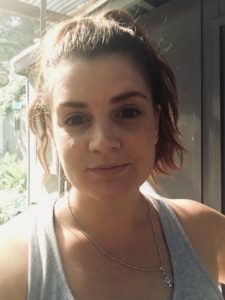 Her knowledge and experience in the hairdressing industry makes her a intuitive and community minded yogi, who creates a calm and safe environment to explore yoga and quietly improve your strength, flexibility and mental wellbeing. Philippa teaches and practices based on Hatha Yoga principals. She finds this practice the perfect balance of stretch, flow, relaxation and mediation. Come and join her for a class.